This 17th century jaw harp (jew’s harp) is a recent metal detector find from Dingwall. 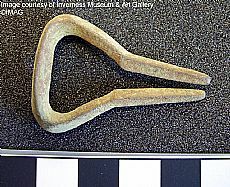 Other examples with the distinctive triangular bow have been found in the Highlands from Dornoch and Fortrose. They must have been very popular, and provide a rare example of early music by ordinary people. Like many found on archaeological sites, it is missing the tongue, suggesting that it broke and was discarded. Gjermund Killtveit 2006. Jew’s Harps in European Archaeology. This find was featured in the ARCH Heritage Along the Kyle Line: Lochluichart to Dingwall display. 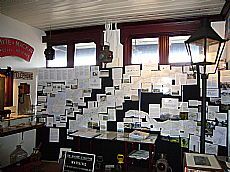 The panels from the display are now at the Friends of the Kyle Line Museum, Kyle Railsay Station, where they have been joined to the displays from the first two ARCH Heritage Along the Kyle Line courses. Worth a visit!